Palpable fear gripped the residents of coastal communities of Brass Local Government Area of Bayelsa State following explosion that rocked oil pipelines belonging to the Nigerian Agip Oil Company. 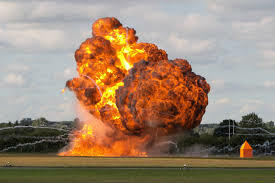 ‎The explosion, which was said to have been triggered by dynamite attacks allegedly launched by suspected militants affected pipelines located in Orukari, Golubokiri and Kpongbokiri communities of Brass. The development, it was learnt had led to many residents of the riverside communities scampering for safety. It was learnt that the attacks were launched on Thursday night and had led to massive spillage of crude from the Agip pipeline into the sea and fishing camps. ‎Confirming the incident, member representing Brass Constituency 1 in the Bayelsa State House of Assembly, Mr. Israel Sunny-Goli, condemned the attack on Agip pipelines. Sunny-Goli, in a statement on Saturday, ‎said, “Preliminary investigations indicate that the bombing of the pipeline was an act of sabotage carried out to hurt the economic interests of Bayelsa state and Nigeria. Sunny-Goli called on security agencies to beef up security around oil facilities to ensure they prevent future attack by economic saboteurs bent on crippling Nigeria’s economy. The lawmaker added, “I want to condemn the latest attack on Agip pipeline at Kpongbokiri. This is a clear sabotage by economic saboteurs. Recently, they blasted pipeline at Orukari and Golubokiri. ” I condemn this latest attack on Agip pipeline at Kpongbokiri in its entirety. It is sabotage against Nigeria in a bid to cripple the economy at a time the nation is struggling with decline in revenue due to the fall in oil prices. He urged Bayelsans, especially those that have oil facilities around them to be be vigilant and report any suspicious movement to security agencies to prevent further attacks.